Clio Renaultsport 200 Raider launched | What Car? 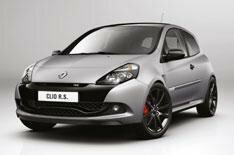 Renault has launched a limited-edition version of its hot Clio, called the Clio Renaultsport 200 Raider. Just 50 of the Raider cars will be sold in the UK. The Renaultsport 200 Raider is based on the Cup model, which has a lower ride height and stiffer suspension than the standard Clio Renaultsport 200. The Raider also gets leather Recaro seats, zinc grey interior trim, Bluetooth, USB connectivity and climate control. Theres a choice of two colour schemes: Stealth Grey and Diavolo Red. Buyers also get the choice of 'Renaultsport Monitor' an on-board telemetry system or Carminat TomTom sat-nav. The Renaultsport 200 Raider will be available to order from the end of October, and is expected to cost around 22,000 4000 more than the Clio Renaultsport 200 Cup.